'Possibly the most impressive novel ever written in the Galician language'. With these words, the eminent critic Basilio Losada describes Suso de Toro's novel Tick-Tock in a letter to the author. Suso de Toro is alternative in everything he does, he rearranges the boundaries, surprises the reader, does the unexpected, persons, tenses change, and what could be construed as an atheistic, chaotic novel acquires hints of religiosity. Nano, the narrator, is a man of uncertain age who has never made it in the world, but who likes to hold forth all the same, to fill notebooks with his thoughts on fishing in the Gran Sol, on controlling his libido, on inventing machines that serve no purpose. The novel centres on his experiences, and on the lives of those around him: his mother, his father and half-brother, the people who occupy the building where his mother cleans. 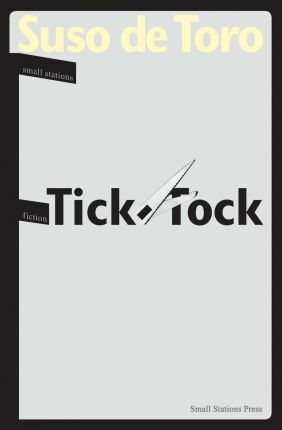 Tick-Tock, a sequel to Polaroid, received the Spanish Critics' Prize for its unconventionality and narrative expertise, and is the author's most popular work.